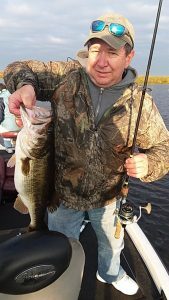 Scott Shafer Ohio and his long time buddy came fishing this afternoon and we caught some nice fish all of which look like they are eating well. 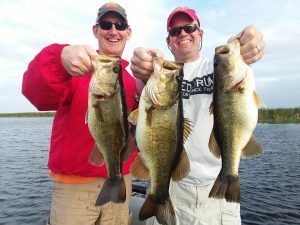 These guys enjoyed the Florida weather and were thankful to get out of the wind and ice of Ohio. 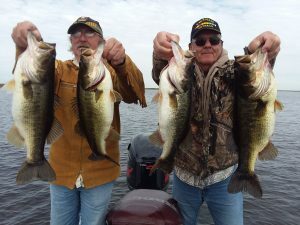 These guys haven’t fished in years but they got back into it like riding an old bike. The fish bit strange today many times hey would chase the shiner around hit at it but never take the bait. The weather being cold may have something to do with the fish slowing down a little but it was still great fishing! 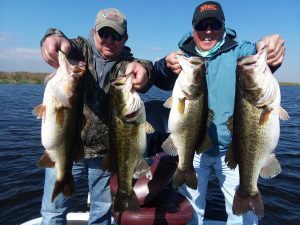 John Tarant and his longtime buddy who now lives in Okeechobee came fishing with us today and what a day it was! These guys wrecked em catching several BIG fish and a lot of them. The lake has been fishing really well although the weather hasn’t been that great. The water temp. are expected to drop even more over the next few days probably making the fishing tougher. These fish are trying to spawn that is why you are seeing these big bellies on the males and the females. This year has been great so far come and join us this Winter to escape the harsh northern weather. Danny and Delbert both caught a ton more fish today Delbert had the front of the boat today and Danny from the back still whooped him again. Danny caught 22 to Delbert’s 13. Today’s fish were slightly fewer than yesterday but they were bigger fish. Today we had 1 fish 6lbs 13oz. 1-6lbs 12oz. 1-6lbs 8oz. and 1-5 lbs 13oz. The fishing has been just awesome and I can’t wait to get out there the next morning and see what the day is going to bring! Although the weather is getting colder and the water temps. are dropping for the moment the big girls are still chewing so come on down and join us this winter. 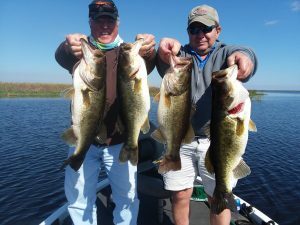 Danny Koon and his long time buddy Delbert have come fishing with Okeechobee Guide Service and Okeechobee Bass Fishing at least 7 times in the last 6 months and these guys know how to get it done! 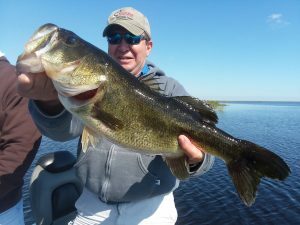 We caught nearly 40 bass today with 6 fish over 5 lbs and 3 fish over 6 lbs. They also lost some really good fish that got off when they wrapped up in the grass. 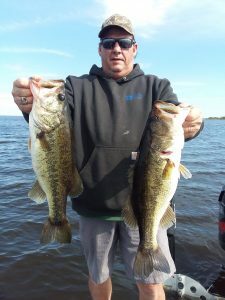 These big girls are moving up to spawn and there will be days coming up that will provide several quality fish in a day. The cooler weather has slowed the bite down a little but as you can see they are still eating. 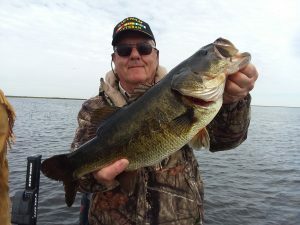 Delbert sat in the back of the boat today and Danny destroyed him in the numbers but Delbert got the BIG bass of the day weighing a little under 7lbs. 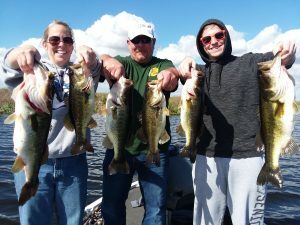 Rochelle, Eric and their son Dillon came all the way from Minnesota to catch some Okeechobee Pigs with Lake Okeechobee Bass Fishing and Okeechobee Fishing Guides and boy did they take care of business! 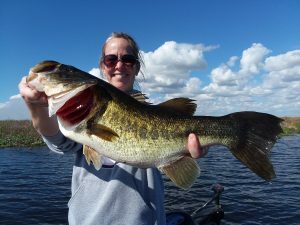 Rochelle caught one that weighed 6lbs. 10oz. 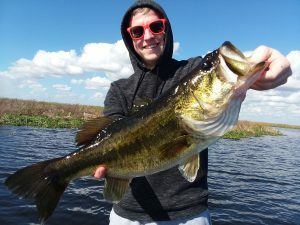 Eric caught one weighing 6lbs. 5oz. and Eric caught one weighing just over 5lbs. We also caught plenty of other nice fish throughout the 6 hour trip today. This morning started with another mid 40 morning but the fish played along with the 4th fish of the day weighing the most before the sun even came above the horizon. This family was a joy to be with and I am POSITIVE i will be seeing them again in the future. If you haven’t booked your trip NOW is the time these fish are spawning and you could catch the fish of a lifetime AT ANY time. Brock Hardy from Ohio and I fished artificial baits on Saturday and we got a bunch of nice fish. These fish came in less than 2 ft of water and there were lots of them. Throughout the day we probably caught 30 or so bass and lost a few in the weeds that rapped us up in the weeds when they ate it. They were very aggressive today chasing the baits and even busting the lure up on the top several times today. Brock is in the area doing concrete work for a huge warehouse being built. He is already planning a return trip in Feb because we caught so many good fish. 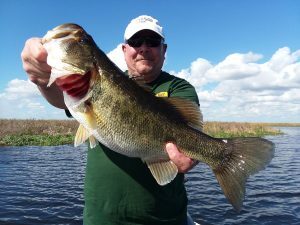 If you are planning on coming down to Florida this Fall/Winter you should give us a call and catch some of the beautiful Okeechobee Bass with Okeechobee Bass Fishing! 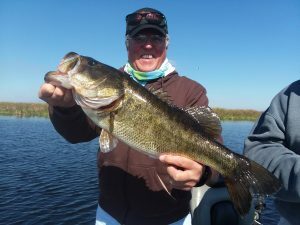 Check out the website OkeechobeeBassFishing.com or call TODAY!